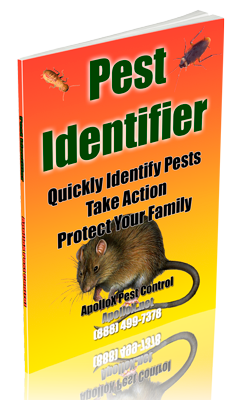 ApolloX Pest Control will remove carpenter bees from your home quickly, efficiently, and safely. 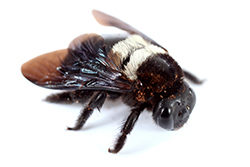 Carpenter bees resemble bumblebees in both size and appearance but often lack yellow stripes. Most of the top of the abdomen of carpenter bees is without hairs and is shiny black in color. By contrast, the abdomen of bumblebees is fully clothed with hairs, many of them yellow in color. If you see a number of large bees hovering near the eaves of the house or drilling in wood, you have carpenter bees. Carpenter bees do not eat wood. They construct their nests in trees or in frame buildings. They usually attack unpainted objects such as doors, windowsills, roof eaves, shingles, railings, telephone poles, and sometimes wooden lawn furniture. They bore through soft woods to lay eggs and protect their larvae as they develop. 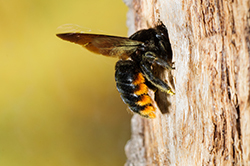 A carpenter bee begins her nest by drilling a nearly perfectly round entrance hole (about 1/2 inch diameter) into the wood. This hole is usually against the grain of the wood. When the tunnel is about 1 inch deep, the bee turns at right angles to the initial hole and tunnels with the grain of the wood. Bees prefer to attack wood that is greater than two inches thick. The male bee is unable to sting. The female however, is capable of stinging but seldom does. She must be extremely provoked (i.e. handled) before she will sting. 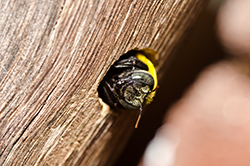 While the damage to wood from the drilling activities of a single bee is slight, the subsequent year’s broods will expand the tunnel through branching activities and may cause considerable structural damage. Additionally, they will commonly defecate on the wall or other item directly below the opening causing stains. 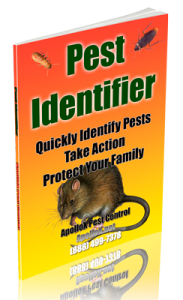 Call ApolloX Pest Control for carpenter bees pest control in the Fairfield County CT towns of Fairfield, Black Rock, Bridgeport, Cos Cob, Darien, Easton, Greenfield Hill, Greenwich, New Canaan, Noroton, North Stamford, Norwalk, Old Greenwich, Redding (lower), Ridgefield (lower), Riverside, Rowayton, Shelton, Southport, Stamford, Stratford, Trumbull, Weston, Westport & Wilton.